Do you want to know the #1 reason you'll miss your sales targets? Do you want to know the #1 reason you’ll miss your sales targets? I know… you’re probably about to tell me what it is, but you’re more than likely wrong. Did you guess a lack of leads or sales? – That would be wrong. How about inefficiencies? – Yup, still wrong. The big, scary monster keeping you from achieving your quota is what’s called the sales performance gap. 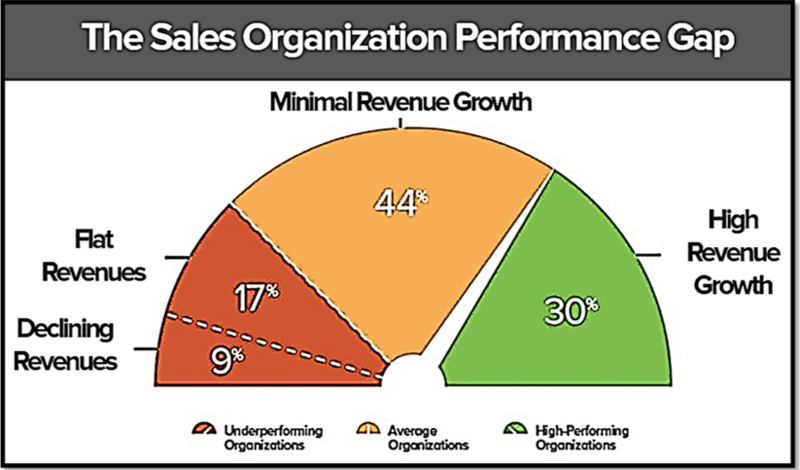 Almost every sales organization experiences a large percentage of their revenue being generated by the same group of top sales performers, month after month. It’s this widely misunderstood concept that separates the top 20% of your sales reps from the rest of the herd. 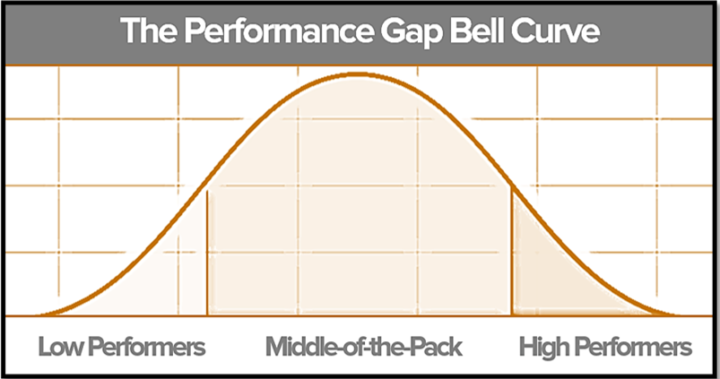 The result of this separation creates a performance bell curve similar to the one in this picture. It creates a “great divide” among your sales force and wreaks havoc on your ability to hit your targets. Additionally, your cost per sale, turnover rate, and even job tenure as a sales leader get all jacked up. This performance gap is actually getting wider across the majority of sales organizations, not smaller. 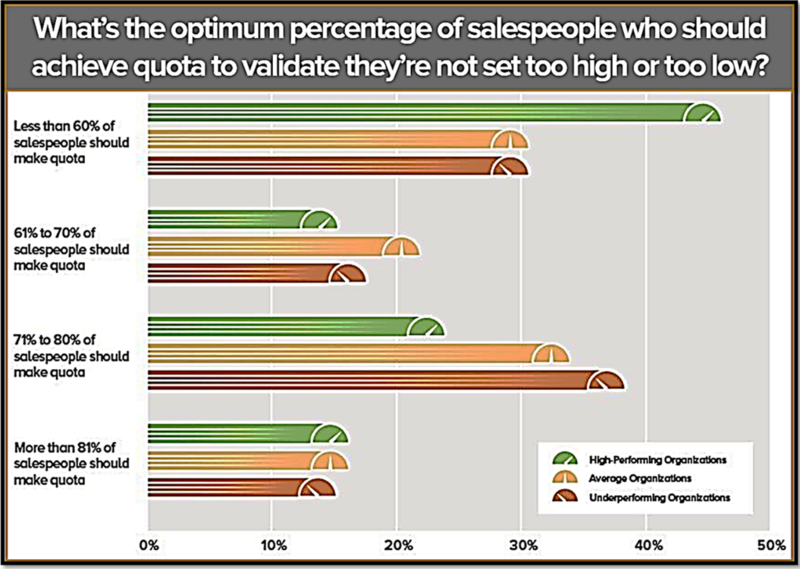 The impact of this is leading to a decline in the percentage of sales teams attaining full quota, shrinking each year. Despite the continual decline in quota attainment, Sibson Consulting found that annual quotas continue to rise, increasing by 7.5% each year over the previous two years. CEB notes that the performance gap between top sales reps and the rest of the team is amplified in complex, high-value sales environments. For transactional sales, the average performance gap is 59%; however, in complex selling environments the gap is nearly 200% more, or 3x as wide. If just a tiny narrowing were to take place, the result would drive a significant improvement in revenue. In a study conducted by Steve W. Martin, a sales expert and author from the University of Southern California’s Marshall Business School, it was revealed that the highest performing sales teams routinely set more aggressive goals. These organizations developed more structured sales processes while sharing more optimistic opinions about their team members and sales organizations. A key highlight from the study, which garnered just shy of 800 respondents comprised of sales executives and managers, concludes that top-performing sales organizations set higher quotas and anticipated fewer reps achieving quota. This is done through the process of setting SMART sales goals. The reason setting goals is so effective is because it creates and establishes accountability. If a sales rep commits to achieving something, there’s no excuse for them not to. Three significant differentiators separate stellar sales teams from mediocre teams. The teams who performed better experienced a drastically larger annual revenue growth compared to the middle-of-the-pack teams who were typically experiencing flat or declining growth. 46% of the high-performing organizations responding stated that fewer than 60% of salespeople should achieve quota, compared to a mere 30% of those at an average or under-performing organization. The tougher and stricter quota led to 18% of high-performing companies terminating sales reps for poor performance after only one quarter. Contrarily, only 2% of average organizations, and 5% of under-performing organizations, terminated a member of their team after a single quarter of missing their sales targets. The best performing teams are more aggressive in their approach. They actually set higher quotas that they expect fewer salespeople to meet in order to drive performance and keep them hungry. These organizations had a team-oriented mentality with a rigid structure that they used to drive success. A team mentality was almost twice as likely to be found among high-performing teams, leading to the description of themselves as “a cohesive group of like-minded individuals.” The challenge of a higher quota and stricter process brought members of the team together. In short, the serious atmosphere and large challenges facing the team weeded out the weak. Once they were gone, the sales force was a collection of strong-willed, highly motivated individuals all working toward the same goal. Because of this, the best teams placed a lesser importance on individual talent for success than mediocre groups, and were also less likely to have below-average salespeople due to a unified culture. As you could likely imagine, the width of the gap has some horrific costs associated with it when you stop to consider it. The effects of the performance gap means that the majority of your sales force is operating as “B-players,” which typically hovers them around approximately 80% of their quota. Having such a large group of B-players means that you’re missing out on a large amount of revenue. What happens is hundreds of qualified opportunities get dumped into your sales pipeline, but ultimately fail to ever materialize and convert into a paying customer. These are deals that could have, and should have, been closed, but didn’t. If you can find a way to reduce the gap ever so slightly, you’ll see an impactful result. With the amount of deals that are being lost due to B-players, consider the effects of increasing your close rate by just 5%. That could be huge. The average sales reps are always going to close some deals; it’s not like they’re completely useless. The issues is that they have to sift through numerous lost opportunities before finally getting a win, much more than all-stars do. The deals that do actually come in reduce your profit margins by going through a lengthier sales cycle. The average deal size of these individuals is also considerably less than what your top performers generate. Plus they burn through a hell of a lot more leads because they have more losses, on top of going through more leads to produce smaller deals over an extended period of time. An astonishing 26% of all turnover in sales is a result of reps missing their quotas. This makes your costs skyrocket because of the financial investment required to replace and train a new salesperson. The numerous costs associated with this individual leaving leads to an average price tag of $115,000 needed to replace and train a new hire. While poor recruiting is certainly a culprit, the greater focus for this issue stems from your “C-Players,” or the bottom 20% of your sales force. Your middle-of-the-road salespeople are those possessing high potential. They’ve demonstrated high potential, but it’s been unpredictable. These people have yet to master the concept of performing consistently at a high rate. Introduce consistency to your B-Players, and you can go anywhere you want. The negative spiral affecting quota attainment happens to coincide at a point in time when sales leaders are getting terminated at a quicker rate. Their average tenure once stood tall at a respectable 26 months, but has inched its way down to a disturbing 19 months. The average tenure length has been shrinking for leadership positions for well over a decade. That’s not as big of a deal as current trends appear to be. The rate at which the average tenure for these positions has contracted over the last two to three years is what’s really alarming. It might be just a bit of an understatement to say that there’s a little “cause for concern” among these roles. More like widespread panic after the NFL found Tom Brady deflating footballs so offensive that they needed to take him to Federal Court because that one ounce loss of air really affected his performance in a 45 – 7 victory. Good job NFL – you got him! They won by 38 points because the balls didn’t weigh enough, well played. The following 15 attributes were revealed by a performance gap that exists across the varying levels of performance among different sales organizations. Each factor serves to further define and demonstrate optimum sales organization performance.